If you liked this show, you should follow Denise and Janice Tunnell. Join us tonight at 9pm EST/6pm PST as we chat with Dr. Anthony Youn, Aurthor of "The Age Fix". Don't buy another overpriced cream.Hold off on that invasive procedure.Stop avoiding the reflection in the mirror.Get your Age Fix. Dr. Anthony Youn is the rare plastic surgeon who does everything he can to keep his patients out of the operating room. He's spent the past sixteen years researching the secrets of plastic surgeons, dermatologists, makeup artists, and dietitians, and he knows what works, what doesn't, and what's overpriced. Now he's compiled solutions to every cosmetic aging problem in this definitive anti-aging bible. Whether you want to stay as natural as possible or you're interested to know which creams and medical procedures actually work (and are worth the price tag), THE AGE FIX has your fix to look younger and more radiant. Dr. Youn's customizable Age Fix routine will help you improve skin health, whatever your age or concerns, and his diet-based Age Fix prescription will rejuvenate your skin and overall health from the inside out. Did you know that the foods you choose every day can contribute to fine lines and wrinkles and the likelihood of your getting a sunburn? Dr. Youn explains why you should shun soda but reach for that glass of red wine. You'll also discover which fruit can help you look younger and prevent sun damage and which supplements are proven to reduce fine lines. 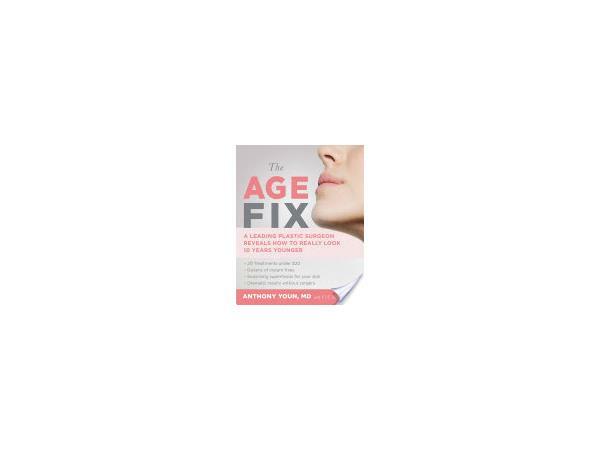 From your face, to your neck, your hands, your eyes, and your body, THE AGE FIX has you covered with an abundance of actionable takeaways and insider advice to help you reclaim your youthful glow-without spending a fortune or going under the knife!